This entry was posted in Favorite Friday, Homework and tagged Google Documents, homework, math, spreadsheet, Wiki by I Speak Math. Bookmark the permalink. Seriously brilliant! Thank you so much for sharing how you plan a lesson!!! Ah, so sweet! Thanks for the compliment. I’m just the shortcut queen and am FOREVER looking for automated ways to save time! lol! I have also tried the plan book, but found that many weeks were often blank after I started posting the weekly schedule on our class website. That method does not provide me a good view for looking at for the next year. In the GDoc spreadsheet, do you copy and paste that individual week from ‘6th 2011’ to the ‘6th’? Or is it somehow automated? Very nice! 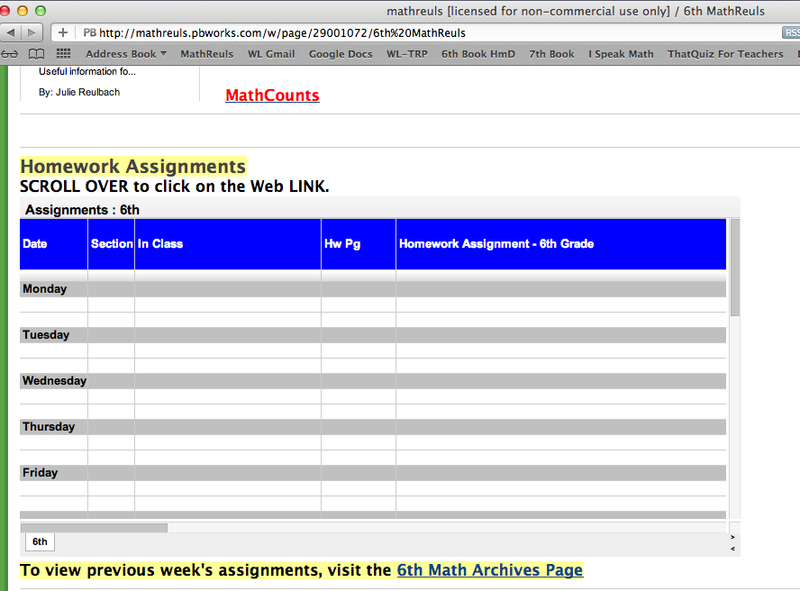 I have a wiki, but this year my 7th grade math team is planning on having a Google Site. It will be interesting to see how that works out for us. I’m very interested in the Google sites. Please let me know how it goes! I’m curious as to how they compare to wikis.